From coast to coast, Canada crushes it in the quality of its wine, and brings home more awards every year. But that doesn’t mean success is going to its head. Many wineries are accessible and local, dusting off old notions of pretentious oenophiles of the past and embracing the surge of younger and more casual wine aficionados. The most abundant grape-growing happens in British Columbia and Ontario, but inventive and bold vintners are cropping up in new places all the time. Choosing favourites is quite a subjective matter, but we’ve broken down some of the best places to taste by what you might like to pair with your sipping experience. So take our advice or follow your own path—with these wines, you’re in for a win, wherever you land. You know your way around a wine menu and may even consider yourself a pseudo-sommelier, so these places should interest you the most. They’re producing liquid gold on the regular, and garnering medals to match. When only the best will do, these are the Canadian wine regions for you. Bottom left: Yelp/Lise P.; Bottom right: Yelp/Chris D.
Canadian wine production has a winning track record in British Columbia. 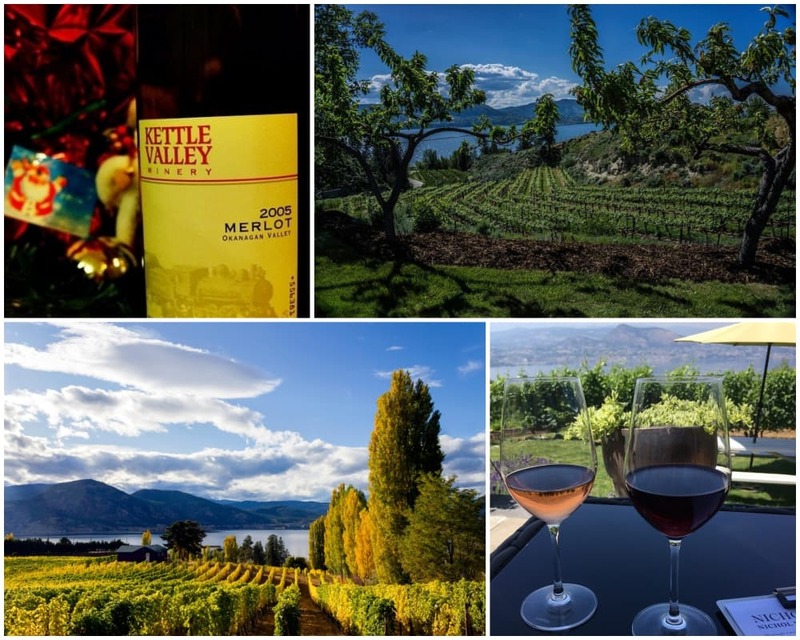 Okanagan Valley boasts an impressive 172 wineries, and is the gold standard for BC wines. Okanagan wineries brought home both Best Red and Best White of the Year at the All Canadian Wine Championships in 2017. Okanagan Valley yields some of the most popular Canadian wines, and is the most-awarded wine country in Canada. Vintages like the Hatch’s Black Swift Long Road Syrah 2013 are so highly rated they could run for Prime Minister. Red lovers will relish Sandhill Estate Vineyard near Oliver, where the 2014 Howard Soon Red will show you why it earned top marks. Get it while you can. 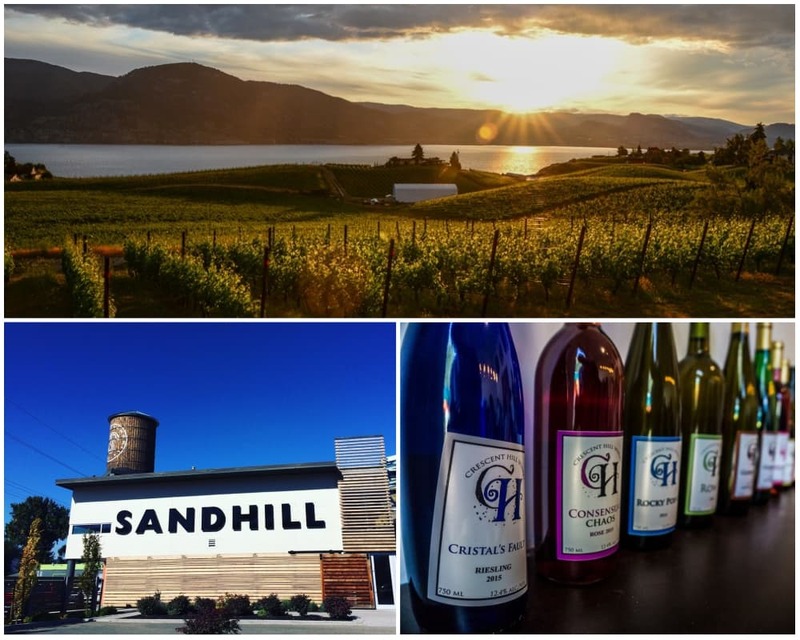 Crescent Hill Winery in Penticton offers the stuff of dreams for white wine fans with its Gewurztraminer. It doesn’t hurt that this homey winery is a joy to visit, with beautiful views and deep family roots. Top left: Yelp/N M; Top right: Yelp/Stefanie S.; Bottom right: Yelp/Julie T.
Speaking of accolades, Niagara-on-the-Lake, the birthplace of the Ontario wine industry, has some hefty titles under its belt. The 37 wineries in this region have taken high honours in many competitions, from the Ontario Wine Awards to international prizes. The Niagara Wine Festival is a must-attend event, where regional wines and cuisine delight the palate, and concerts and parades entertain your other senses. 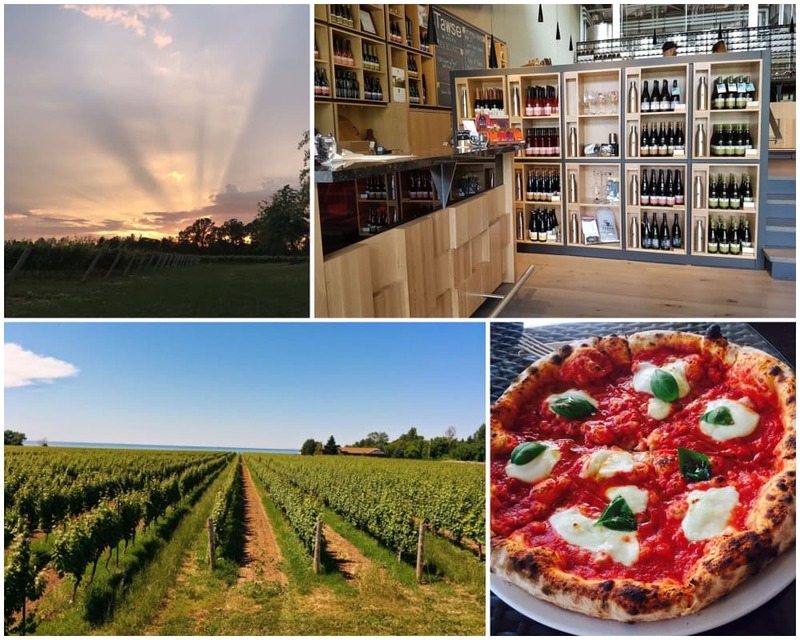 The toast of the town, Tawse Winery, has taken Winery of the Year at four WineAlign National Wine Awards and is the whole package, with consistent quality, world-class pinot noir and Riesling (to name a few), and an on-site restaurant. Two Sisters Vineyards pairs high-quality wine with a pleasing atmosphere and delicious pizza from their authentic brick oven. 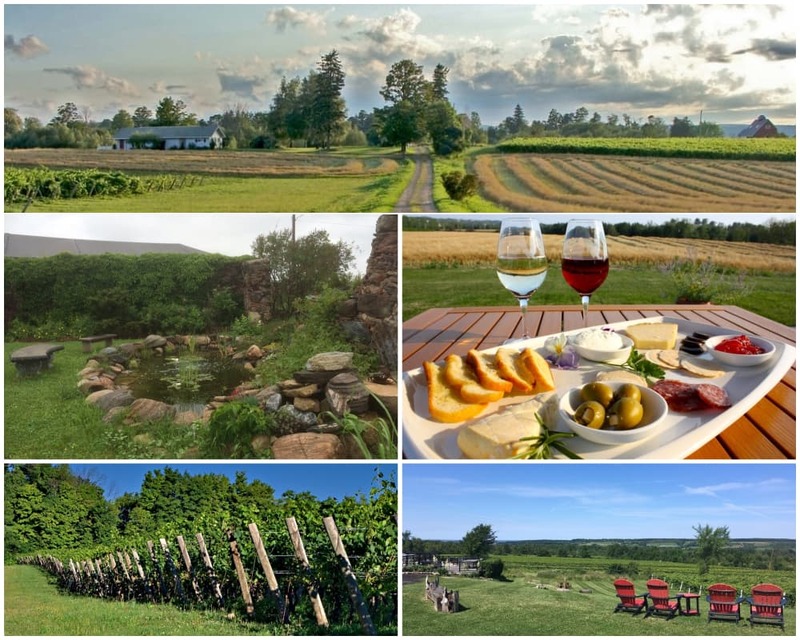 Left: Yelp/Ben B.; Bottom right: Yelp/Leticia P.
Nova Scotia is a dominant cold-climate grape region, perhaps best known for the unique and often full-bodied L’Acadie blanc. The Annapolis Valley is prime growing ground, and other fertile spaces include Gaspereau Valley, Bear River Valley, and the Malagash Peninsula. The two-dozen-or-so wineries are making their names known, especially for their whites, which are full of bright and aromatic nuance that highlight the unique terroir. Sparkling enthusiasts know where to go—Benjamin Bridge Vineyard. This is the premier place for Canadian bubbles, and once you taste the fresh citrus complexity of the sparkling rosé or the rich balance of the brut reserve, you’ll be a convert in no time. 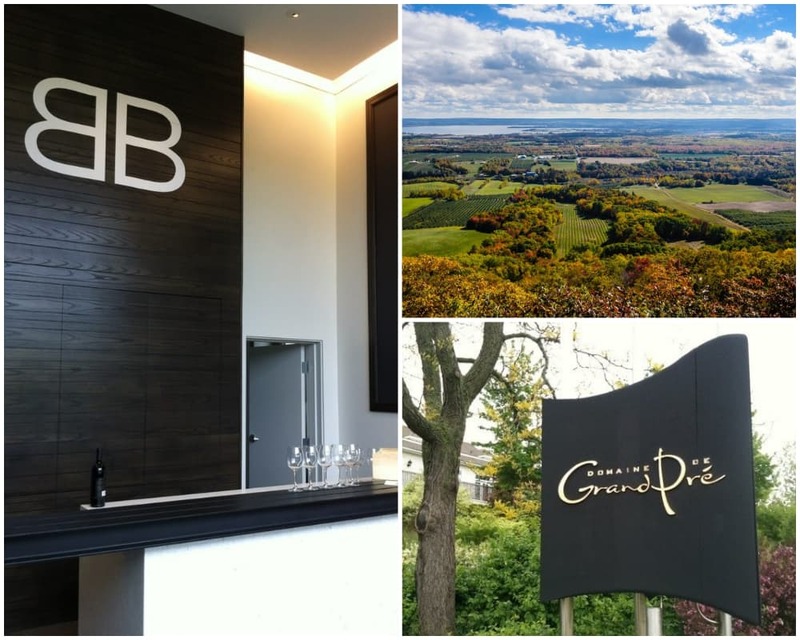 Perhaps no winery is more Nova Scotian than Domaine de Grand Pré. Here, they are committed to producing varietals and styles that represent the flavours and land of Atlantic Canada. Sure, you enjoy wine very much, but it takes more than a full-bodied vintage or a fresh, floral white to set your heart aflutter. If, like a newly opened bottle of red, you are better after a little aeration, these activity-laden regions will be a breath of fresh air. With Vancouver in close proximity, Fraser Valley is an ideal Canadian wine region for those who also want to do some exploring. Pop over to the city or enjoy farm visits, fishing, paragliding, water sports, and farmers markets—there are unending things to do in the area. There also happen to be some great wineries. 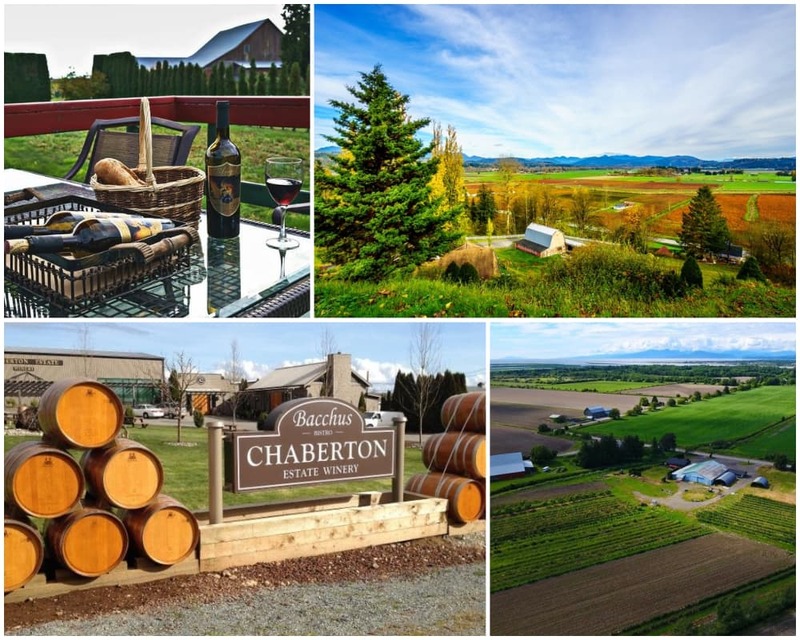 Chaberton Estate Winery in Langley has an on-site bistro and hosts events and year-round tours and tastings. For something different, sample award-winning fruit wine at Angel Estate Winery after a day exploring the paths and ponds of nearby George C. Reifel Migratory Bird Sanctuary. Top left: Yelp/Sheila W.; Top right: Yelp/Chris D.; Bottom right: Yelp/Chris V.
Just 350 km east of Fraser Valley is an agricultural area known as the Naramata Bench. Life is made to savour in this region, where the scenic Okanagan Lake, village charm, and network of farms, orchards, and vineyards invite you to explore everything on offer. Monashee Adventure Tours can show you the ropes. They even host winery walking tours, so you’ll be sure to experience the tastes of the town. One of the first in the region, Nichol Vineyard has really grown into its own. It’s perhaps best known for pioneering syrah in Canada, but pinot gris and pinot noir are also some of their best-loved grapes. Kettle Valley Winery has been perfecting its process since before planting their first pinot noir and chardonnay in 1987. They picked this spot for its potential to grow full-bodied wines, but the surrounding natural beauty make it ripe for outdoor adventure, too—from hiking to biking to water activities. Top left: Yelp/Rodrigo T.; Bottom left: Yelp/Rodrigo T. ; Bottom right: Yelp/Philip S.
At Lake Erie North Shore and Pelee Island, bike trails and beaches are waiting to be explored, while summer festivals entertain during Ontario’s longest growing season. Warm up on an outdoor adventure, then cool down with a crisp white. Hike through Carolinian forests and explore Point Pelee National Park. The bounty of things to do in this sunny, beautiful region is ripe for the picking. Viewpointe Estate Winery hosts festivals and barbecues, and the activities calendar is packed. Take in the lake views as you sip world-class wine, then bring home a bottle or two from their winery shoppe. Taste some of the best of the region at Cooper’s Hawk Vineyard or Oxley Estate Winery, where periodic events have a foodie flair. Pairing the finest vintages with the freshest views is your MO, and you understand that the impression on the eyes is just as important as on the palate. A truly good wine deserves an aesthetically divine backdrop, so put these places at the top of your must-see list. 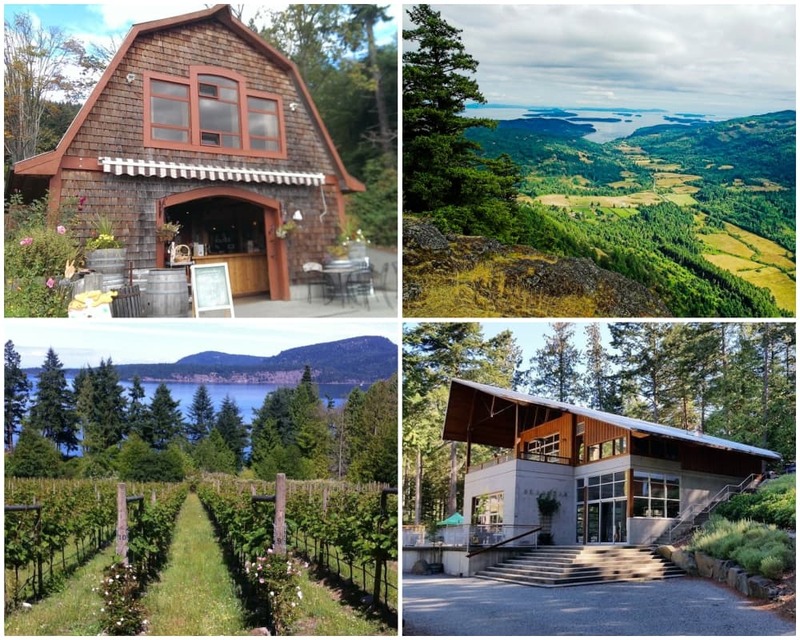 Comprising one of the smallest regions in BC, the Gulf Islands are so charming and gorgeous, you won’t even need wine goggles to fall in love. Incidentally, you’ll encounter some wonderful vino while taking in the fetching setting. Sea Star Vineyards on Pender Island is tucked against a forest backdrop with direct views of the sea, making this a truly unique environment. Delight in award-winning wines in a blissful setting; leave with a big smile on your face. Salt Spring Vineyards invites you to picnic by their pond and enjoy a complimentary tasting. If you’re celebrating something special, order the Karma brut-style bubbly, and let the cheery atmosphere put a spring in your step. 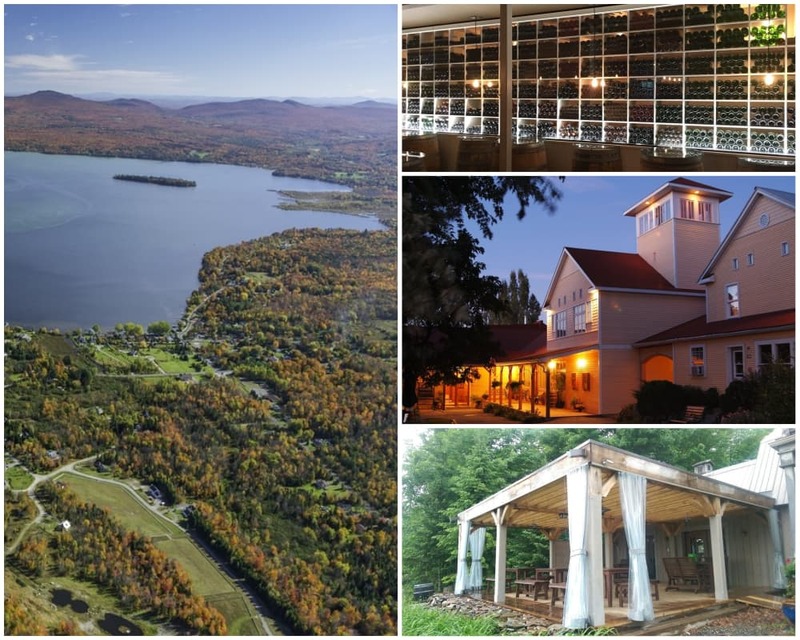 The Eastern Townships in Quebec are emerging as late-season experts, and the surrounding lakes and valleys make this a scenic road trip region with benefits. Come for the views, stay for the wine. Either way, you’ll love it here. Léon Courville is set high on rolling slopes overlooking Lac Brome with views of Mont Orford and its surrounds. Enjoy a bottle of Cuvée Charlotte or pinot noir reserve and breathe in the aromas of perfection. At Le Vignoble de l’Orpailleur, the region’s loveliness is in full force on the shaded terrace. Indulge in bites to rival your wine at the on-site restaurant, Le Tire-Bouchon. 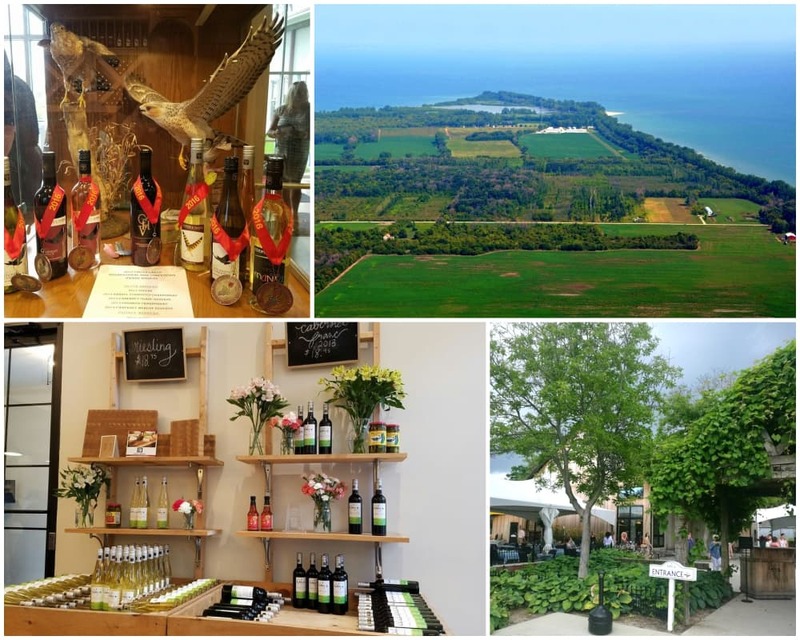 Left: Yelp/Victoria S.; Top right: Yelp/Karen F.; Top middle right: Yelp/Arlan B.; Bottom right: Yelp/Pauline W.
With its southerly locale on the shores of Lake Ontario, the pretty Prince Edward County is a wine lover’s paradise with the views to match. Picturesque is an understatement in this neck of the woods, where charming villages dot the coastline of the country’s finest freshwater beaches. 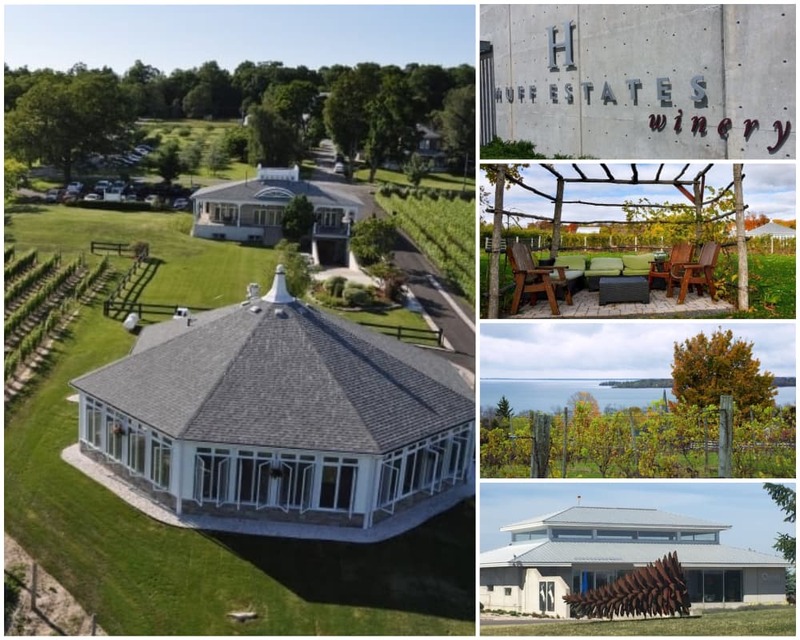 At Waupoos Estates Winery, the stunning views of Lake Ontario make it a prime location for special events and unforgettable days. The sparkling-white rounded pavilion offers almost a complete circle of enviable vantage points, and once the sun starts to set, everything is bathed in pinks and golds. Huff Estates lets you enjoy vineyard views from the large patio at the restaurant, but get ready to see more than leaves and vines at the on-site art gallery featuring Canadian and international multi-media artists. You like to kick back and enjoy the fruits of your labour (or someone else’s, for that matter), and you prefer to savour the end result than examine the ins and outs. You’re not one to mince words like tannin, briary, or vinous. Like ’em leggy? Sure! A toasty varietal, you say? Bring it on! From fruity to flinty, it’s about drinking what you like, and enjoying the process. Colder-climate grapes love Montérégie, and Montérégie loves visitors. Especially those who appreciate the brilliant offerings of the region. It’s full of stars like Mont-Saint-Hilaire for its ancient forests, trails, and lake, and Saint-Jean-sur-Richelieu with its hot air balloon festival and Chambly Canal walkways. Prepare to be charmed by Le Mas des Patriotes, where restored farm buildings house a feeling of warmth and welcome. Bring home a bottle of Le Sieur Rivard Réserve, and be sure to take a guided tour of the vineyard. Domaine St-Jacques produces flavour-rich wines, like their seyval-forward whites and beautiful rosé. Run in the spirit of sustainability, this vignoble is tended with a lot of heart and care, and the results speak for themselves. 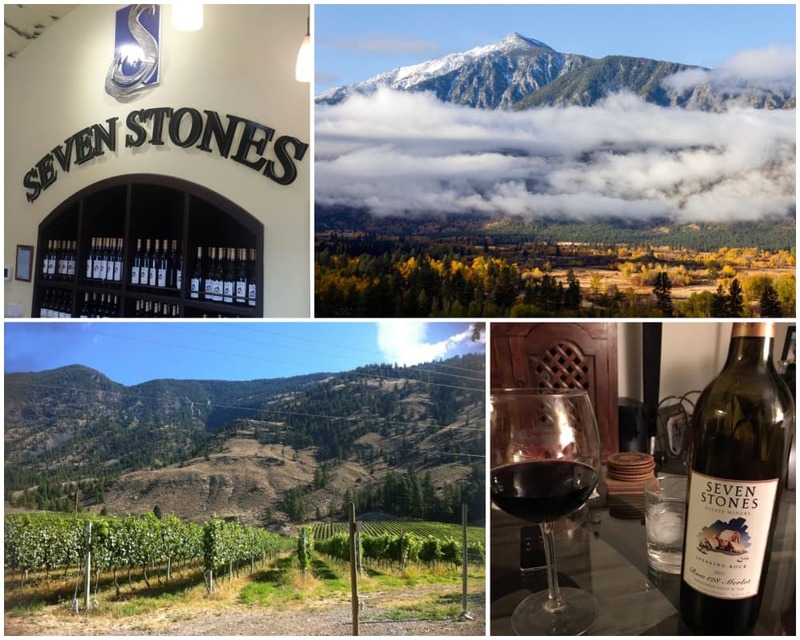 Top left: Yelp/Ron P.; Bottom left: Yelp/Lauren L.; Bottom right: Yelp/Brock S.
Merlot and chardonnay are top grapes in Similkameen Valley, and the 19 licensed wineries of the region produce world-class vintages with no aftertaste of attitude. Rugged mountain landscapes, organic farms, and friendly small towns make up the personality of this area, where there is much to take in, and peaceful scenery to soothe. Seven Stones Winery holds tastings in the underground caves, where the cool, dusky atmosphere lends itself to quiet contemplation. The gorgeous above-ground views don’t hurt, either. The small-batch, single-vineyard Little Farm Winery is as unpretentious as they come, lovingly operated using sustainable practices. 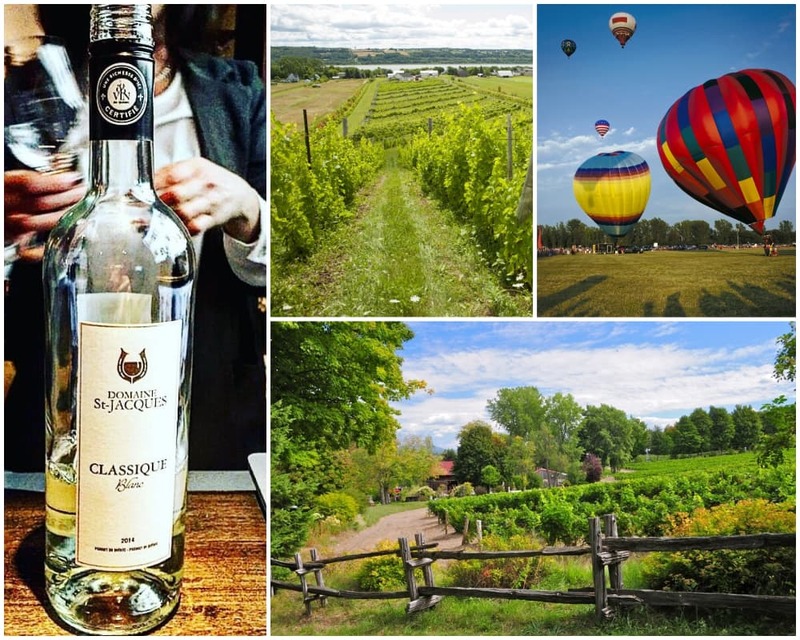 Bottom left: Flickr/Michael Pardo; Bottom right: Yelp/ Doc E.
With a handful of experimental wineries set against Georgian Bay and the Niagara Escarpment, this emerging region is the perfect place to stretch your legs and expand your knowledge. The VQA Wine Truck stops at events and festivals throughout Ontario, bringing regional wine in its wake. The wine comes to you—what could be better than that? The deck at Coffin Ridge beckons with soft music, vineyard views, and the vintner’s cheese and bread plate with custom wine pairings. Learn about the art of cool-climate wines at Georgian Hills Vineyards, where no reservations are needed at their inviting tasting room and you’re encouraged to linger over charcuterie and wines to suit your tastes. When it comes to the perfect place to sip and swirl wine, these top Canadian wineries stand out. Each brings unique terroirs and is producing wines with distinctive character and alluring flavour. Pick between jam-packed adventure itineraries or relaxed tastings in peaceful surroundings. These exceptional regions across the country offer enough to satisfy every personal taste. 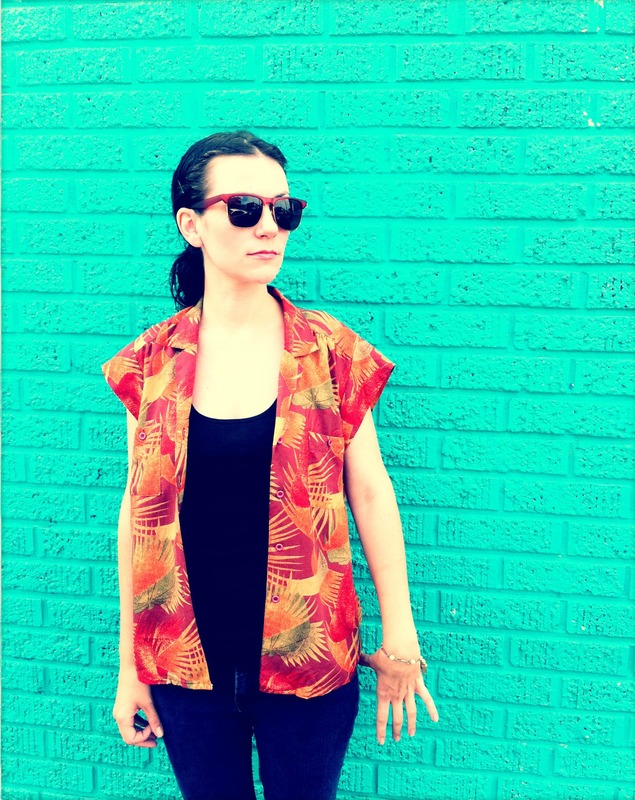 Lily is a travel and lifestyle writer and editor. She aspires to never be too far away from her next adventure, whether it be exploring arid deserts or the mossy forests of her native Pacific Northwest. She also loves international travel and always looks forward to crossing another destination off her bucket list. Canadian wines are delicious! We are making our mark on the World Map of Wines.